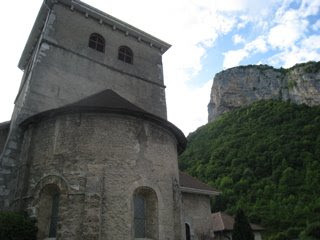 L'Eglise de Viuz has an incredible setting under this massive rock formation. It was the site of a cult in the Roman period, the first church appeared in the 7th century or so, and the choir of the present church dates from the 12th century. The acoustic, of course, is wonderful.